In the past two years I have asked you to show me your hometown. This year I waited until May in hopes of warmer weather. As I walked through the history of Seneca Falls and then photographed a monument to Christopher Columbus in the City of Syracuse a couple of days later, I thought everywhere there is history to be discovered. This got me to thinking of changing the hometown assignment up this time. So, this month’s assignment will be about Hometown History. Specifically, Your Hometown as in year’s past. Whether your hometown has centuries of history or less than a hundred years, you can find places, people, things and stories about its past. Columbus Monument statue in front of the Onondaga County Court House at Columbus Circle in Syracuse, New York. Nikon D700/28-300VR, 10s, f/16, ISO 200, EV 0, 92mm focal length, tripod. As in the other assignments, do not send me your photos. What I would like you to do is post them on your blog, flickr or other photo sharing site, personal website or any other place on the Internet where you can place a link to it here by making a comment to this blog entry. Then we can visit those sites and enjoy everyone’s Hometown History. Please, have your photos posted on or before Midnight (your time), Wednesday, May 25, 2011. Don’t have a place to post? Might be a good time to start up a blog or join a photo community like flickr. As I have done for all the Assignments, I’ll put together a recap with my comments. 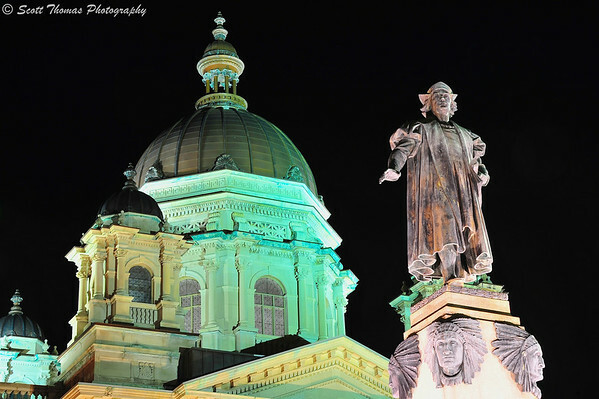 This entry was posted in Assignments and tagged 28-300mm, architecture, columbus, court house, history, new york, nikon D700, onondaga county, statue, syracuse, vr. Bookmark the permalink. Another assignment I’ll have to skip… going to be impossible to take pictures of my hometown. Even if it wasn’t, I wouldn’t want to post pictures (or the name) of the town where I live now. Dallas/Dallas area is as close as it’s going to get. Sorry, Scott, Dallas is boring, and I have no desire to learn about its history. What about your current hometown? You must live somewhere. 🙂 Ireland is full of history, isn’t it? Afraid so. How was your time in our nation’s capitol? Thank you Scott for not giving this assignment in March like last year! You’re welcome, Jennifer! Looking forward to what you show us. Hmmm… the town I live in isn’t exactly a town (more like a crossroads), but I might be able to do something interesting. And if not, I’ll head over to Akron or Cleveland and see what I can do there. That’s the spirit but you might find the crossroads has a secret to tell. I know of some near me which have interesting stories of their past. Holy Wah! OK, I will accept two challenges. As requested, I will show you something about northern Michigan’s past, although I will warn you that here, as in Faulkner’s Mississippi, the past is never dead. It isn’t even past. Per my self-imposed challenge, I will sneak up on you with a story that even the most history-averse among your readers will be unable to resist. Stealth history. That’a girl! Hmmm…stealth history. Something I wish a few history teachers I had knew something about! LOL! This sounds interesting, I might have to do a little research. I hope it is interesting, Nye. Always good to know a little about where you live that you didn’t know before. I´ll go and find some interesting spots in Copenhagen, that´ll be fun, – and surely interesting to see the photos connected to this assignment, not to talk about Gerry´s stealth history! Can´t wait to read it! Hi, stumbled across this from another photo blog that I follow, I think I might give it a try. I live in Ireland, but moved to a tiny town last year so it’ll be interesting to learn about my new town! Welcome, Denise! Hit the local pub and ask what the people there have to say about the history of your new town. I will do my best to find some shots that I didn’t use last year in the March assignment! Think of your town’s history, I am sure you’ll come up with something new and different. Or a new way of something you’ve done before. I have already posted quite a few pictures of my present hometown, so I may drive to my “real” home town, much smaller, but quite interesting too. That’s a good challenge, thank you, Scott. That would be marvelous, Isa. Looking forward to it. OK, since I was just in my hometown–my “real” hometown in downstate Michigan, there just might be something usable in the current batch of photos. Will go a lookin’. Thank you kindly! thanks for the challenge! I enjoyed taking these photos, and enjoyed sharing them too! Look forward to seeing the links to other hometowns! Short time left for this assignment…that’s what I get for not keeping up! 🙂 But I live in a tiny little place…post office, party store, fire department. That’s about it. I know it has history though…so will find some..if it stops raining long enough for me to get out and get the shot! I found your challange via Kathy’s blog. I’m not much of a photographer. Just a point and click. But I thought this would be fun! Thanks for the “homework assignment”! I enjoyed it!! This was fun and got me out to visit a place I hadn’t been to before, and to meet the owner! Thanks for pushing me beyond my normal routine! I consider Ann Arbor, Michigan to be my hometown. I have lived in Ann Arbor for the past 52 years. The assignment brought to mind a bit of history I witnessed when I was a sophomore at the University of Michigan. I gathered with thousands of others to see the handsome young presidential candidate who was to appear on the Michigan Union steps at 11:00 at night. When JFK came out the front door at 2 in the morning. The crowd surged forward and I don’t know if I heard his plans for the Peace Corps. My main concern was breathing. I had been pushed against a pole and the air was squeezed out of my lungs. I found you through Kathy at Upwoods. Here is my assignment. Hello Scott ! Here is my contribution to your present assignment. Thanks for another interesting theme. Scott, this is my contribution. You are all doing wonderful posts! Here is mine about the The Syracuse and Baldwinsville Railroad which operated in my hometown in the late 1880’s. Curses! A minute late! It’s the Cowboy’s fault–but you knew that, didn’t you. Oh, sure, blame the dog. At least he didn’t eat your assignment. 😉 I’ll let it go this time.